This wonderful coffee spoon was designed by Toyo Ito. The “Il caffé Alessi” collection is growing! A new component, indivisible from the cup: a small coffee spoon. Kaeru is ideal for completing the cups of the same range from the “Tea&Coffee” project in 2003. The aim was to let the greatest international architects create coffee and tea services. They were confronted by designing such objects for the first time. This time, the designer produces a fabulous collection! 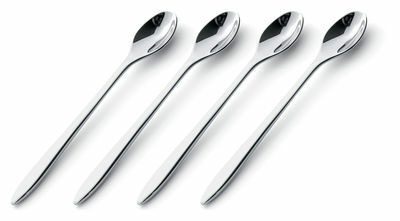 The small coffee spoons are sold in sets of 4 (price above is for 1 set of 4).